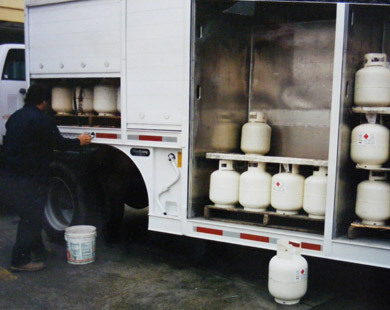 Many Propane Distributors are finding the cylinder exchange market is a sales niche that can be very profitable. 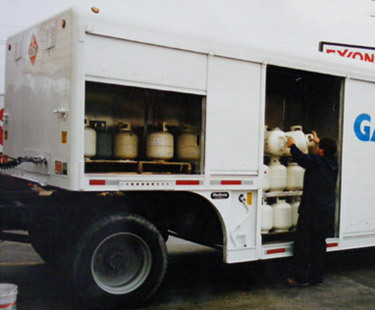 Whether it is grille tanks, fork lift fuel cylinders, or industrial cylinders, Hackney builds bodies and trailers to fit any size and capacity requirement. Unique bay widths and starter sections customize our roll-up side door models to achieve the most productive and cost efficient design for your operation. And safety and ergonomic considerations are emphasized in the Hackney design, not added on as after thoughts. Let Hackney help you cash in on this revenue opportunity with a modern body or trailer that is specifically built for the job and designed for exceptional longevity.